The Angriest: Star Trek: The Next Generation: "Firstborn"
It is 25 April 1994, and time for another episode of Star Trek: The Next Generation. While Worf (Michael Dorn) encourages his son Alexander (Brian Bonsall) to better embrace his Klingon heritage, he comes under attack from a House of Duras assassin. When the Klingon warrior K'mtar (James Sloyan) arrives to protect and guide Worf, the two men come to blows over how Alexander's instruction in Klingon tradition should be done - and indeed his future in general. And that's it for Brian Bonsall's run as Alexander Rozhenko, after a seven-episode run across three seasons. Generally speaking, fans have been quite harsh on Alexander; both the character and Bonsall's performance. To be honest I'm a mild fan of both. Could the character have been better written? Possibly, but it was a genuinely nice extension of Worf's character to make him a father - particularly of a son who is not particularly interested in being a Klingon warrior any time soon. As for Bonsall's performance, I always found it reasonable for a child actor. Again, I am sure better actors might have been available but Bonsall had the experience from Family Ties and was by all accounts a consummate professional on set - those count for a lot. When you balance everything out, I honestly think Alexander was a positive gain for the series. He goes out on an unexpectedly good episode as well. 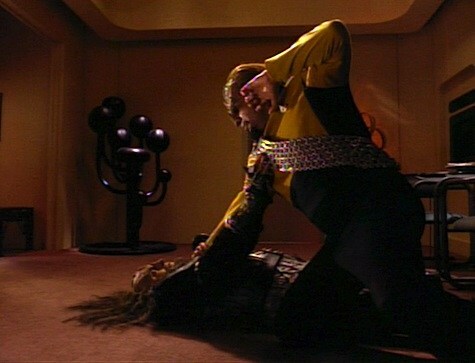 There is a nice extension of Klingon culture in the episode's earlier scenes, a strong battle of wills between Worf and K'mtar in the middle, and then a genuinely surprising climax at the end. It was not a twist I saw coming, and it not only deepens the relationship between Worf and his son it also provides an opportunity for a very touching scene between Michael Dorn and James Sloyan. The time travel elements are a bit rubbish the moment you think about them, but I think the emotional payoff outweighs those problems. There's also a slight irritation about basing the episode around Worf and his son at all. Let's recap a bit of Season 7 for a moment. Specifically, let's count back how many episodes have focused on relatives of the USS Enterprise command crew. "Descent, Part II" featured Data's brother, "Interface" Geordi's mother, "Dark Page" Troi's mother, "Inheritance" Data's mother, "Homeward" Worf's brother, "Sub Rosa" Crusher's grandmother, and "Journey's End" Crusher's son Wesley. This is the eighth episode of the season to focus on family and there's a ninth coming hot on its heels. I am not sure what the development process was within the Next Generation writers room, but that is one hell of a dominant theme for the year and it has not been an overly fruitful one. Even a half-decent effort like "Firstborn" struggles a little because it's the eighth family episode in a row. Overall it's an enjoyable hour of Star Trek, making it the 12th decent episode out of 21 Season 7 episodes to date. The quality ratio rises to 57 per cent.